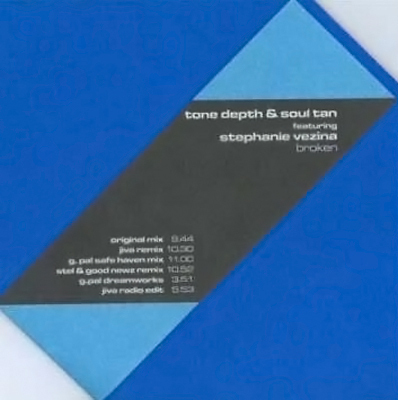 The duo of Tone Depth and Soul Tan (better known to most as Sultan) emerged several months ago and quickly made their mark on the music scene with their deep and hypnotic grooves, emotional melodies and instruments and late night vibes. Their productions and remixes are widely respected, and their work alongside Stephanie Vezina has produced several high caliber singles. 'Broken' is their latest work with this talented singer, and has quickly become KLIK Records in collaboration with Swift Records most anticipated release, and the wait has been worth it. The 'Original Mix' shuffles its way along, subtle layers of drums and percussion building over a moody atmosphere that slowly fades into prominence. The effect in itself is pretty hypnotic, drawing you in as it takes over, compelling you to remain. It's hidden secret is the softly spoken vocals of Stephanie Vezina that emerge, filling the void that remains as the drums intensify. The dark intensity is counteracted by warm guitar refrains and soon euphoric waves ripple through the groove, where they lead into a cascading array of sounds. 'Jiva' do a great job of recreating the track, a rugged breakbeat arrangement setting the standard for what is to come. Stephanie Vezina's vocals are used to great effect, leading as the core element of the mix rather than being an addition to it. The beats are solid and consistent, and her vocals float in an evocative and sultry fashion right through them. 'Broken' is a track you will not forget in a hurry, and one that you will dig out and listen to weeks, months and perhaps even years from now. This is without a doubt the label's finest hour.